With all gratitude and apologies to Trader Joe's for borrowing their name, I intend to use it for the best of all purposes. Awhile back, at another parish, this was the example one gentleman used to describe how he felt about his parish. What he was trying to say was that you can get brand name items at any type of grocery store, big or small. If you wanted something that was really special and unique, the best of quality, you went to Trader Joe's. At Trader Joe's you won't find Oreos he said, you'll find their own version of the famous cookie and so much more to delight in. That's what St Francis de Sales has become I believe. We are not just any parish church here in the Archdiocese of New York. We are a 'destination parish!' We are the place you want to come to for spiritual nourishment, for community, for music and homilies that will rock your world and make you think about ways you want to be a better person in your world! Jesus is truly present here, in the Eucharist and in the Word, in our community gathered as one. Here we learn and we practice this essential truth of our faith, not only is Jesus the bread of life, the bread of our lives, but we have a mandate to be bread for one another. This is evidenced in the smiles and hugs, in the concern for one another, in everyone watching out for each others children as they wander around the church. 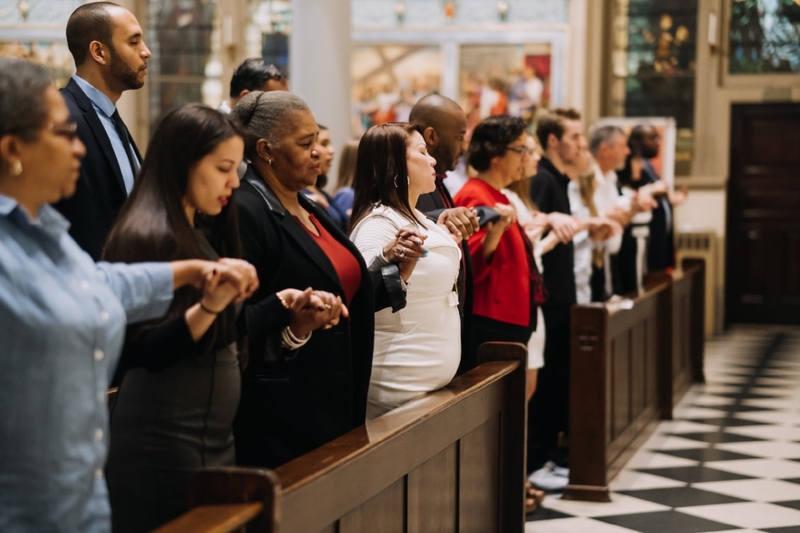 I see it most strongly when we greet one another at the opening of Mass, we hold hands for the Lord's Prayer and embrace at the sign of peace. This is a church community that I am so proud to call my own, and always so happy to come home to. As we anticipate (not yet, I know. One parishioner teacher referred to August as the Sunday night of the summer....sigh...) the rush and busyness of September perhaps we can take a few minutes while the sun is still shining to ask ourselves how we will be more present and more involved in our parish home in the year to come? Our lives are incredibly busy, for sure, but what is more important that taking a little extra time to take care of ourselves? How can our parish help you do that? Perhaps you want to join a small Christian Community to make time to pray with a few other folks? Perhaps you want to sing in the choir? Perhaps you can come to Mass early once a month and help greet folks when they come in on Sunday morning-sharing that warm smile that someone once offered you. What gifts do you have to share to make our parish more welcoming , stronger and more vibrant? And please, make no mistake, if you're saying to yourself "I really don't have time to do any more, but I can at least write a check"...heck yeah, we'd love that too...because that check allows us the financial freedom to fund more good works, both here and outside the confines of our own four walls. Jesus said "I am the Bread of Life, those who come to me will not hunger". Together with Jesus, adopting some good Trader Joe's philosophies, St Francis de Sales seeks to feed our common hunger for spiritual nourishment we all long for. Don't be surprised if you see us in Hawaiian shirts one day soon!